You must have heard about people using VPN to anonymously access the internet. In this article, we are taking a look at What is VPN, How Does VPN work and other aspects of VPN technology. 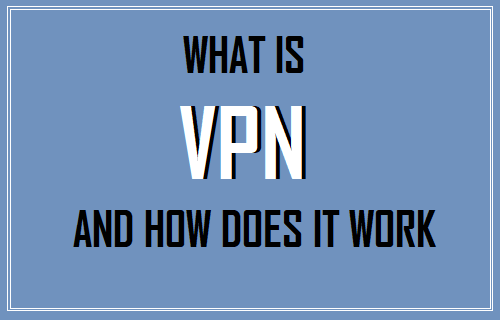 In simple terms, a VPN (Virtual Private Network) can be defined as a protected or secure connection to a Public Network, such as the Internet or a secure connection to a Private Network (Corporations, Govt. Organizations). The VPN technology was originally developed to provide access to networks owned by Corporations, Universities, Schools and Government agencies. The idea behind the VPN technology was to allow remote workers to access and make use of resources owned by corporations and agencies over a secured network. While VPN is still being used to provide secure connection to Corporate Networks, VPN technology has now become common place and is within the reach of any user interested in his/her privacy and security while browsing the web. For individual internet users, it is enough to understand that a VPN cloaks and encrypts your signal and information, making your online activities protected and illegible to anyone who tries to intercept your data. VPN hides and manipulates your IP address, making you appear as someone browsing the internet from another machine, location or country. When you try to access any website on your computer, your computer connects to your Internet Service Provider (ISP) which connects you to the website that you are trying to access. This practically means that all the data transferred between your computer and the internet passes through the servers of your Internet Service provider (ISP) and this can be easily accessed by your ISP or anyone who is able to intercept your data. In the case of a VPN, you will be connecting securely to a server run by the VPN provider, which will then connect you to the website that you are trying to access. All the data transfer between your computer and the VPN Server takes place in an encrypted form, making it impossible for your ISP or anyone else to see where you go on the internet and what you do there. Protection: VPN can protect internet users from Hackers, especially while using Public WiFi Networks. Even if a hacker manages to intercept your data, it will be almost impossible for the hacker to understand the data as it will be in an encrypted form. Privacy: VPN hides your activities on the internet from your ISP and everyone else who may have their own reasons for monitoring your activities on the internet. Geo Spoofing: VPN allows you to gain access to services that allow access based on Geographical location. For example, a service like Netflix is geo-restricted and its users are known to use VPN to gain access to Netflix while on holidays in a different country. Secure VOIP Calls : Voice Over IP call services like Skype can be easily intercepted and listened to. Using a VPN service can provide complete protection for VOIP calls. In order to use VPN, you need to look for a reliable VPN service provider and signup for its VPN Services. The cost of VPN service can range from as little as $5/month to as much as $40/month or more, depending on the level of privacy and the features offered. VPN service does not replace your Internet Service Provider. Hence, you will still be requiring the services of your Internet Service Provider and paying the IPS for providing you with Internet Service. Although VPN does protect your privacy it does not provide you with complete anonymity. By using a VPN service, you are basically shifting your trust away from your Internet Service Provider who is not particularly interested in protecting your privacy to VPN service provider who promises to protect your privacy. Unless the VPN service provider is known to purge logs on a daily basis, information about your browsing activity will still be available on the servers of VPN provider and this can be accessed. Also, you need to be aware that VPN Service Providers in certain European Countries (UK, France) are required to keep logs of internet activity on their servers. In case you are seriously concerned about your privacy, you will need to look for VPN Providers that highlight Privacy as their main selling point. VPN service providers like torVPN and TorGuard are two names that appear to be seriously committed to protecting the privacy of their customers. torVPN does not log your connection and promises not to surrender its data without a Hungarian court order. TorGuard claims to purge its VPN logs on a daily basis and does not keep your login and logout times. You can add another layer of security by paying for VPN services anonymously. This way the VPN provider will only know your real IP address but not your real Name and Address. Companies like Private Internet Access and Mullvad accept payment in Bitcoins, anonymously purchased Cards and even accept cash sent by mail. Depending on your computer and the internet connection, you may experience some slowdown while browsing on the internet over a VPN connection. This happens due to the following reasons. Encryption/Decryption: VPN provides security by encrypting the data travelling between your computer and the VPN server. This takes processing power, making your internet slower. With the exception of a few countries, use of VPN is legal in most countries around the world and does provide the level of privacy as promised by VPN Service providers. However, you need to be aware that some countries in Europe (UK, France) require VPN providers to maintain logs of user’s activity on their servers. Also, most countries can legally demand VPN service provider to keep logs for specific individuals, in case it becomes necessary to monitor such individuals for security reasons. In case you are interested, Netherlands, Luxembourg, and Sweden are some of the countries preferred by VPN users, these countries do not require VPN providers to keep logs.